While smart cars grab the headlines, the ground upon which such vehicles will drive is quietly changing. Environmental policy, street design and material technology are converging to usher in the age of the smart road. Next time you go out for a walk, spare a thought for the two humble materials that are more than likely under your feet: sand and aggregate. Water repellent, weather resistant and malleable to human design, they have given strength and resilience to the Earth’s roads for generations. 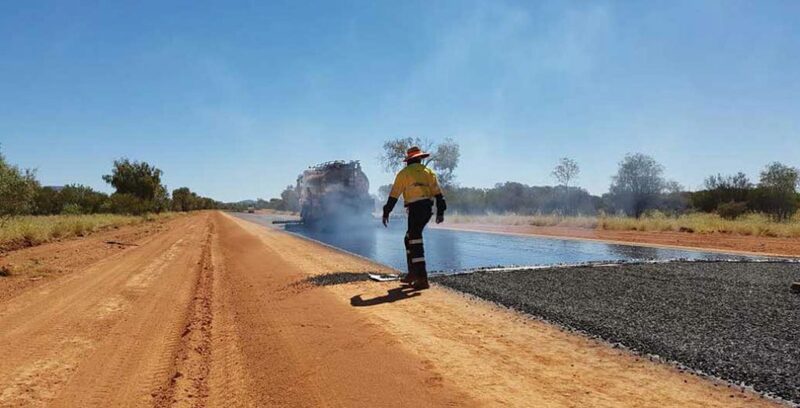 They are also the primary materials used in more than 810,000 kilometres of Australia’s paved roads. Beyond roads, these two humble materials underpin almost every aspect of our expanding built environment. Each Australian requires seven tonnes per annum of quarry materials to support the building of roads, houses and infrastructure to service their needs. Sydney alone uses 20 million tonnes of fine and course aggregate every year. Not surprisingly, then, sources for Sydney’s aggregate are running low. As the city expands, pushing quarries far from the city, transport costs rise, making aggregates more expensive. This fact, combined with the increasing need for roads to multi-task in response to environmental, technical and urban conditions, has driven an army of designers, scientists and businesses to rethink not only the materials we use to make our roads, but also what it is that our roads even do. Each Australian requires seven tonnes per annum of quarry materials to support the building of roads, houses and infrastructure to service their needs. This need to adapt and change is not new. The material history of our roads has been shaped for millennia by multiple factors: the nature of trade and capital, the movement of labour, the vehicles that traversed them, and the materials available locally for their construction. As wheels evolved, so did the street. In the late 19th century, tarred wooden blocks lined the streets of Melbourne’s Collins Street and Sydney’s Darling Harbour. This innovation followed on the heels of wood block streets in America, where the superintendent of Boston, Samuel Nicolson, gave his name to the Nicolson pavement. Now, for the first time in Australia, a practical, resilient surface could support the rigid wheels of carriage transport. According to contemporary accounts, these wood block streets produced a sound of “hideous discord” compared to earlier unsealed muddy roads. But they were quieter and cheaper than their stone alternative. 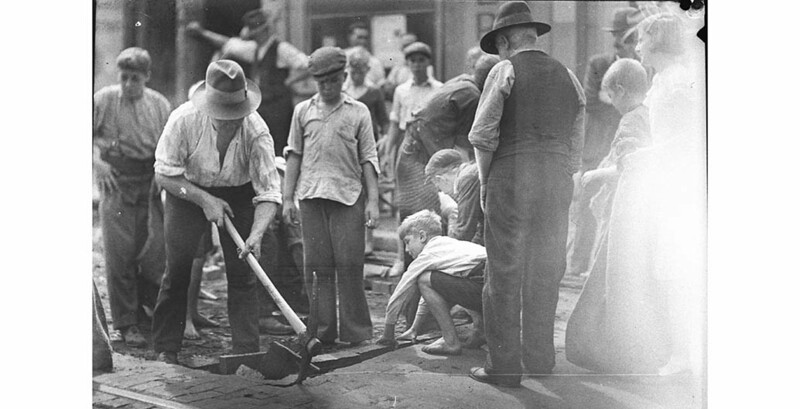 Wood block streets lasted well into the 1930s, when they were finally replaced with asphalt. 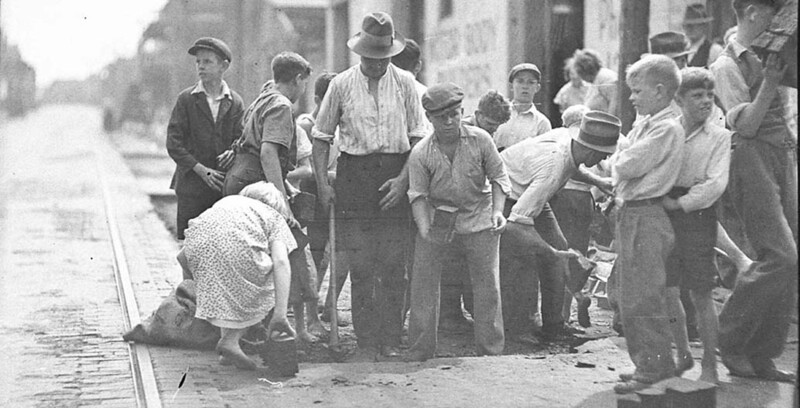 Small gangs of ‘block boys’ sprung up across Australian cities, seizing upon discarded tarred blocks like savaging seagulls and returning home with fuel for the long, cold, depression-era winter. While asphalt had been used sporadically at different times over history, it didn’t really take off on a large scale until the huge underground Swiss asphalt mines of Val-de-Travers commenced commercial production. 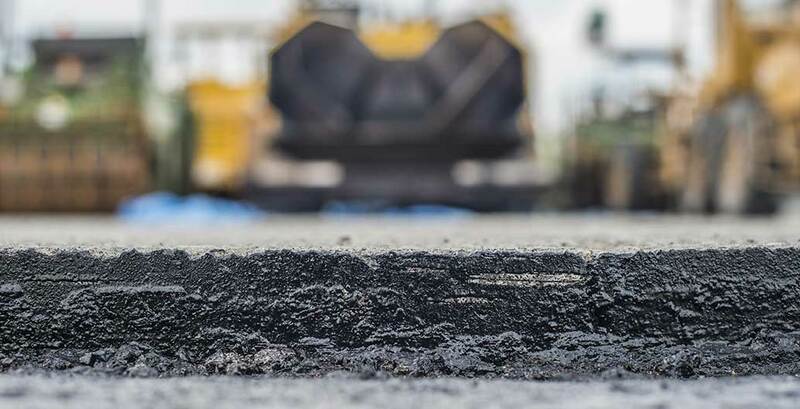 Asphalt, then a new, cutting-edge material, was exported to all corners of the globe, with the Neuchatel Asphalte company providing the asphalt that would line the streets of London, Berlin and Rio de Janeiro, as well as Melbourne and Sydney. For the inhabitants of Sydney, the benefits of traversing these asphalt roads on their brand-spanking new rubber tyres were “cleanliness, noiselessness and ease of traction”. For over a century, driver expectations changed little, even while the recipes for asphalt and concrete evolved. 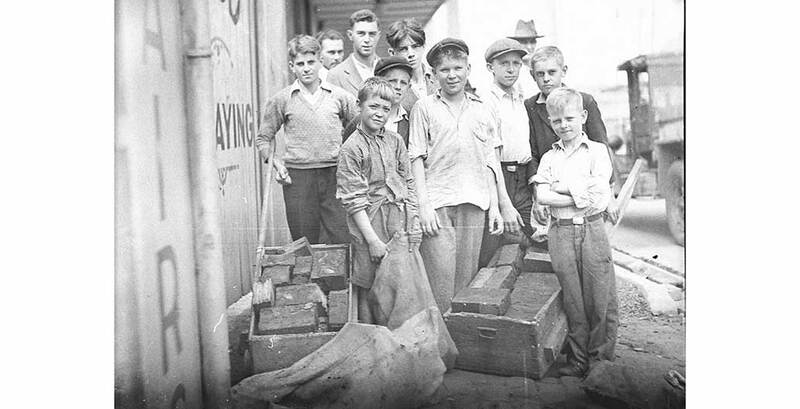 'Block boys' at St Peters, retrieving discarded wooden blocks. Image: Sam Hood. 'Block boys' at St Peters, retrieving discarded wooden blocks. Image: Sam Hood, courtesy State Library of NSW. For most of the past 100 years, the modern road engineer has been interested primarily in two functions: to provide a visual reference for the travelled path and to ensure a vehicle’s mechanical integrity along that path. However, just as the vehicles of the future are evolving, so are the materials, construction methods and uses of roads. Just as the phone has transformed from a tool for making calls to one that touches almost every corner of our lives, so too the humble road surface, once a tool for conveyance from A to B, is being transformed into a multi-functional, versatile everything-tool, that touches almost every corner of the life of the city. For some involved in the design and construction of urban infrastructure, this evolution is not happening fast enough. An example of this philosophy is his recently completed project, Gates of Light. 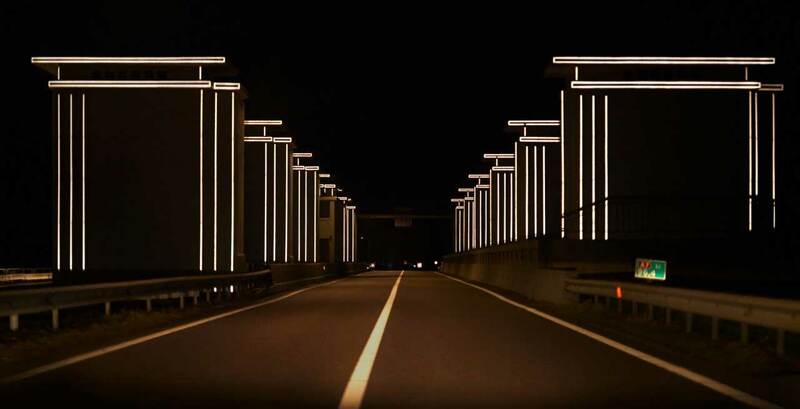 The project playfully exploits new materials to solve an old problem: how to illuminate roads that are marooned from electrical infrastructure. 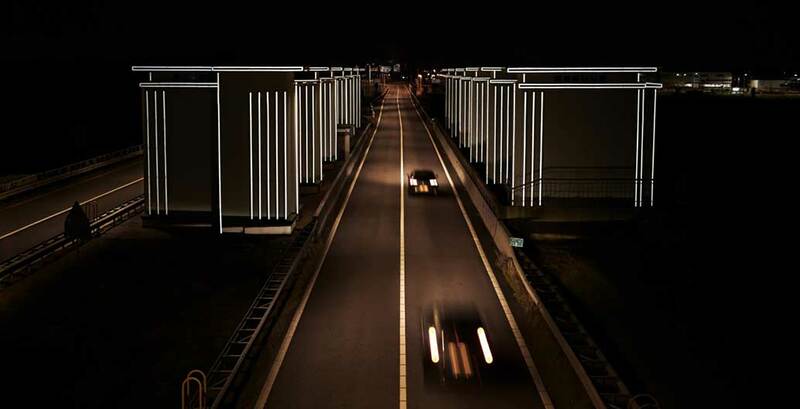 To illuminate 60 enormous dyke floodgates at Afsluitdijk, an hour’s drive north of Amsterdam, Roosegaarde’s studio has developed a surface containing micropearls that reflect light from vehicle headlights. 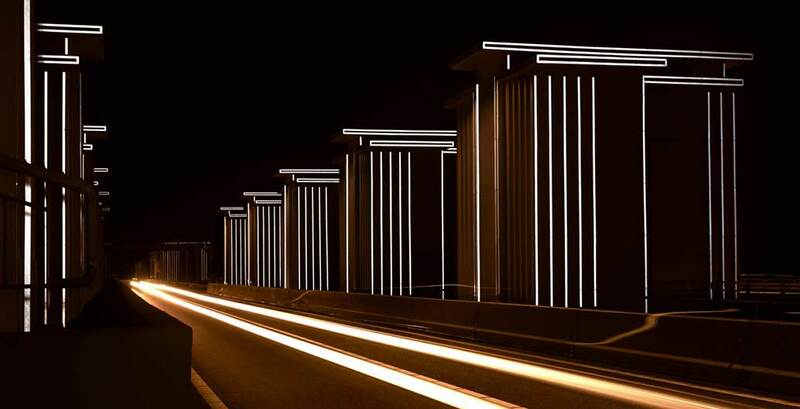 These lines of ephemeral light not only provide an interactive, poetic, theatrical and safe approach to this historical monument, a celebration of the heroic age of engineering, but they do so while minimising light pollution. This removes the negative impact lighting might have on the natural ecology of the fragile wetland environment the road traverses. A design response such as this represents only the beginning of a new way of reinterpreting the conventional road as a place of innovation and creative expression. Engineers and scientists are also rethinking our vehicular arteries and concrete pavements. In a bid to reduce carbon emissions and the environmental footprint of the street, scientists are working towards a deeper understanding of its material components at a micro- and nano-scale. The reduction of carbon emissions is a key goal for many material manufacturers. The cement industry is responsible for about eight percent of global CO2 emissions, according to some estimates. This is hardly surprising, given that concrete is the second most widely used material on earth, after water. Asphalt is one of the easiest materials to recycle on earth and local councils are beginning to realise that the large waste recycled asphalt piles that lie around the cities are a goldmine of cheap raw materials. Some companies have solved this problem by replacing the limestone in their cement with an alternative material and others have changed the way the concrete cures by injecting CO2 into it. As with other frontier green products, the path to commercial, technical and industry success has been rocky and many promising technologies have failed or been adapted to new uses. Australia has led the way in CO2-emissions-free geopolymer concrete. As the Australian think tank Beyond Zero Emissions reports, pavements and roads across Victoria, including sections of the Westgate Freeway, have been built with geopolymer concrete. Unlike ordinary cement, it is processed at room temperature and produces long molecules that link together to give the concrete its strength. At the University of Melbourne, the Geopolymer and Mineral Processing Group is involved in ongoing research to develop better geopolymer concrete recipes. The war on waste has inspired the City of Boroondara in Victoria to embark on another Australian world first. It has trailed the use of a 99 percent recycled asphalt on a section of road. Asphalt is one of the easiest materials to recycle on earth and local councils are beginning to realise that the large piles of waste asphalt that lie around cities are a goldmine of cheap raw materials. 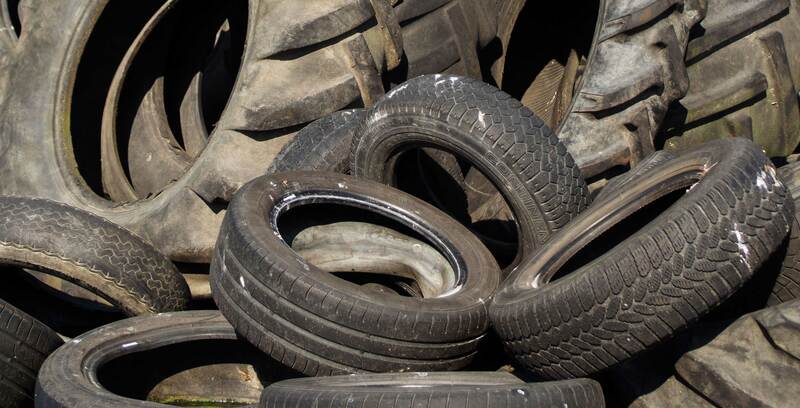 Around Australia, a growing number of both public and private sector institutions are also exploring the use of recycled waste in pavements, breathing new life into everything from printer cartridges and old tyres to crushed car windshields. Could recycled tyres be the smart road material of the future? Roads are noisy, and noise can be stressful. In fact, noise pollution has been found to lead to increased heart rates and blood pressure. Road noise also reduces property values. 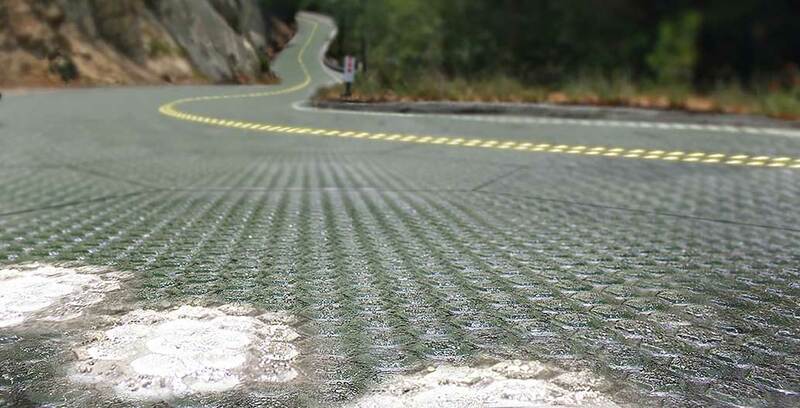 But what if the materials that roads were made of could actually reduce the noise pollution of traffic? Highway traffic noise typically ranges from 70 to 80 decibels, which by comparison, is louder than a loud conversation. Reducing noise pollution by just three decibels is enough to make a listener feel as if the origin of that noise is twice the distance away. 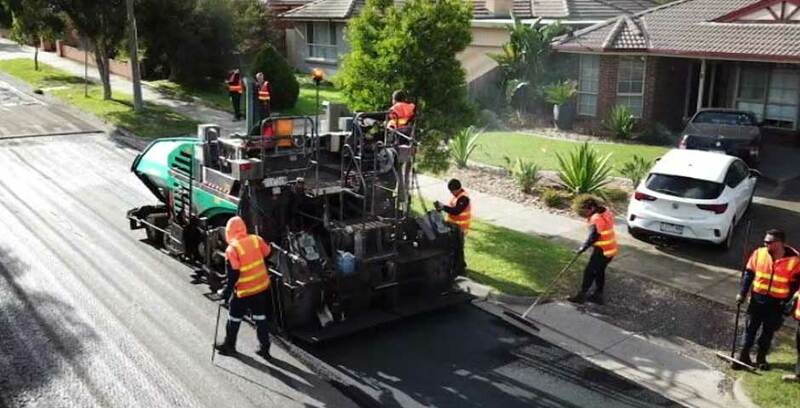 Trials in Australia have shown that special kinds of noise-reducing hot-mix asphalt can decrease the perception of traffic noise by 35 percent. This result can be achieved by adding porosity, or by the addition of materials such as crumb rubber from recycled tyres and modified polymer binders. The shape of a surface can also dissipate noise. Scientists from UNSW are researching additive manufacturing of materials (3D printing) with microtube-shaped holes. In Europe, engineers from Campus de Gandia of the Universitat Politècnica de València have reconfigured existing construction materials to turn a reflective material into a high-performance, sound absorbent material. Aside from noise pollution, smog is another urban ill directly associated with roads. With 95 percent of the world’s population breathing dangerous air, leading to four times as many deaths compared to fatal accidents on the world’s roads every year, pollution engineering is a growing industry. A number of companies have recently demonstrated the potential of titanium dioxide rich cement (Tiocem) to reduce air pollution. It can easily be added as a coating or mixed into the cement used to create facades, roof tiles, pavements, noise barriers and other built elements. Its potential has been displayed to dramatic effect on the façade of a hospital in Mexico City, the Torre de Especialidades. The building lies in one of the most polluted cities on earth and has a 2500-square-metre honeycomb screen of tiles, which its inventors claim can remove the pollution created by 8750 cars every day. A new breed of product designer is also considering the street not just as a surface to travel but as a potential component in a complex energy grid. Plentiful acres of road surface have the potential to become a precious additional piece of real estate, to gather and utilise the sun’s energy. For this reason, a new breed of product designer is considering the street not just as a surface to travel, but as a potential component in a complex energy grid. After China, America is the world’s most energy-hungry country. Not surprisingly, the prospect of replacing thousands of kilometres of asphalt with electricity generating solar panels is attracting significant funding from the US government and venture capital. There is already a proposal underway to introduce solar panels onto the iconic US Route 66, turning it into a smart road. But even small countries like Budapest are getting in on the act, with a new startup creating interlocking solar paving units that have been installed on a shopping mall pavement. The units have also been incorporated into street furniture allowing the public to watch the street, dream and charge their mobile devices. Their latest project saw these trafficable pavers built into a wooden pontoon at a marina in Gotenburg, which allows energy to be harvested and delivered to boats and lighting. While solar energy is a mainstay of smart road research, piezoelectricity is increasingly making its presence felt. Piezoelectricity is the electric charge that accumulates in certain solid materials in response to applied mechanical stress. Engineers are looking to harness the electromechanical energy conversion properties of piezoelectric materials to harvest road vibration, weight, motion and temperature energy with promising results. The Chinese have shown significant interest in this material’s potential and have recently discovered a flexible organic piezoelectric substance that could be tested in new applications, including roads. 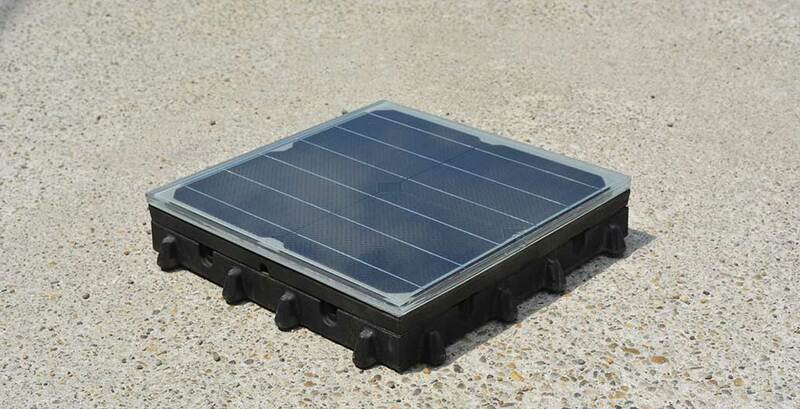 Platio is a modular solar paving system made from recycled plastic. 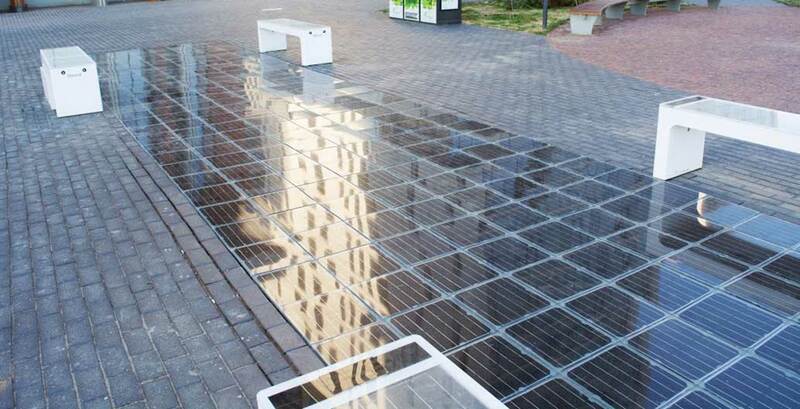 A trial section of modular solar paving outside a shopping mall. As we all know, road surfaces can get super hot during summer. In August 2018, the heat simply melted sections of asphalt road in Europe. At the University of Texas researchers have been exploring ways to make productive use of roads’ capacity to absorb the sun’s rays. Using a geothermal gradient present between the hot road surface and the cool soil beneath, they were able to use a thermoelectric generator, installed on the shoulder of the road, to harness the heat flow and generate electricity at a test site at the university. This technology could be a breakthrough for airports. As the lead engineer, Samer Dessouky, explained: “during a blackout, this could be used as a back-up source of power for illuminating LED at runways and taxiways or could be used as the sole means of lighting rural civilian airport runways”. If the road can be wired to generate and distribute energy, it is a small step further to connect it to wider urban information networks. China’s Qilu Transportation considers the road of the future as also providing brains and a nervous system to the city, in a country that plans to retrofit its roads to be smart enough to match its shiny new fleet of smart cars. Qilu Transportation’s one kilometre induction road at Jinan will power 800 houses, has a design life of 20 years and has three layers, to capture solar energy and information such as traffic flow, weight and temperature. Within days of opening, thieves stole a section of the see-through concrete, temporarily delaying operation. However, by April 2018 the smart road had generated more than 96,000 kWh of power, used to light signs, signals, sprinklers and toll gates. The company hopes that it will soon be recharging cars as they pass. Roads have been a common corollary to prosperity and growing economies since ancient times. Around 80,000 kilometres of surfaced road, cored with stone and cement, played an essential role in facilitating and enabling the Roman empire. In places such as Syria, these beautifully made roads still support the passage of human history, the boots of passing armies and swarms of sandaled tourists. These worn roads and paths of a past civilisation, placed with great care by famous armies, have endured millennia. But just as technology is disrupting every other part of our lives, it is also transforming our roads and presenting new opportunities. As David Levinson notes during a recent Foreground panel discussion, autonomous vehicles present the possibility of greater efficiency of road use, reducing the space needed for cars. This prospect will allow roads to accommodate new, diverse uses. Our open spaces, waterways, built form and transport systems all need to be considered as parts of a connected, dynamic urban ecology. The same is true of our roads. No longer maligned as the bringer of pollution and congestion, with a bit of material and design innovation, it is possible that the smart roads of the future could be part of the solution to today’s energy, environmental and material needs. Michelle Grosser is a science historian, writer and geologist, currently working at Fulton Hogan in the areas of technical quality and operational improvement.